On Tuesday night, Republicans won big: They picked up governorships in blue states like Maryland, Massachusetts, and Illinois, and they held House seats in competitive districts with embarrassing incumbents like Michael Grimm of New York, who physically threatened a reporter and is under indictment for tax evasion. But their biggest win by far was taking control of the U.S. Senate. As of this writing, Republicans had already secured 52 Senate seats, thanks to knocking off Democratic incumbents or replacing retiring Democrats in Arkansas, Colorado, Iowa, Montana, North Carolina, South Dakota, and West Virginia. Another GOP pick up is probable in Alaska, and Republican Rep. Bill Cassidy is likely to win the runoff in Louisiana against Sen. Mary Landrieu in December. This is not good news for the climate. The party that controls the majority and the committee chairmanships controls the agenda. Sen. Mitch McConnell (R-Ky.) will now be the majority leader. McConnell deflects questions about whether he accepts climate science by saying he isn’t a scientist and citing climate-denying conservative pundit George Will. But he is clear about where he stands on fossil fuels, especially coal: He loves them. Attacking President Obama for not sharing his passion for burning carbon was central to McConnell’s reelection campaign this year. If you thought Landrieu, chair of the Senate Energy and Commerce Committee, was too pro–fossil fuel, just wait until Republican Lisa Murkowski of Alaska takes the gavel. 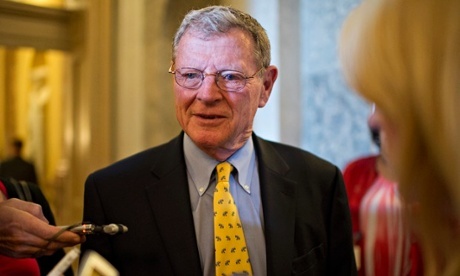 Leading climate denier James Inhofe of Oklahoma will be taking over the Senate Environment and Public Works Committee, and fellow denier Ted Cruz (R-Texas) will be chairing the Committee on Science and Technology. The Republicans have two top energy-related demands: stop EPA from regulating CO2 and approve the Keystone XL pipeline. In the House, Republicans have voted to strip the EPA of its authority to regulate GHGs. That measure died in the Senate because of Democratic opposition. Sen. Susan Collins of Maine was the only Senate Republican to vote against it, and even she had voted once previously to revoke the EPA’s GHG regulatory authority. Obama has staked his second-term legacy on reducing GHG emissions, in large part through the EPA power plant regulations. Those regulations are also essentialto setting the U.S. on a path to meet its promised emissions reductions under the Copenhagen Accord of 2009. Obama will not let congressional Republicans make him look like a feckless liar to our allies, whose cooperation we need to get a more ambitious climate agreement in the 2015 round of negotiations in Paris. So Obama will make a stand on EPA authority if he must. And before it even comes to that, Senate Democrats will likely throttle any EPA authority repeal with a filibuster. Keystone is more vulnerable. Many Democrats from fossil fuel-dependent states have called for its approval. As former Republican Speaker of the House Newt Gingrich said on CNN Tuesday night, “This Republican House and Republican Senate will pass the Keystone XL pipeline.” Speaking on Fox News the same night, GOP Dark Overlord Karl Rove said that Republicans would look to pass legislation that could get Democratic votes and cited Keystone XL as an example. Republicans won’t just pass Keystone approval on its own for Obama to veto. They will continue their strategy of attaching it to unrelated bills, from anodyne energy-efficiency measures to the budget. No one really knows what Obama thinks about Keystone, but it is widely assumed that he was happy to let it go through until activists rose up in protest. Obama would probably like to mollify his base after the midterms by rejecting Keystone, but there’s no guarantee he won’t be willing to trade it away with newly empowered Republicans. Republicans know they may need to force Obama’s hand on Keystone precisely because of the pressure he will get from his base to reject it. And they will try to do just that. With control of both houses of Congress, Republicans can pass any bill they want unless Senate Democrats threaten a filibuster. That doesn’t mean Republicans can enact any law they want. Obama can veto their bills, and now his little-used veto pen will be put to work. But Obama can’t simply prevent the GOP from doing anything at all. Some legislation has to get passed just to keep the government running, such as approving a budget and raising the debt ceiling. Ever since Republicans won control of the House in 2010, they have been exploiting those requirements to try to force Obama to sign off on their agenda. Now, with control of the Senate, Republicans will be in a stronger position to demand that Obama give in to or compromise on some of their demands. If he doesn’t, they can cause a government shutdown, or trigger a global financial collapse by breaching the debt ceiling and defaulting on the U.S. national debt. I know what you’re thinking: “But shutting down the government or defaulting on our debt would be terrible for America!” Don’t be so naive as to mistake congressional Republicans for rational human beings or patriotic Americans. They are so beholden to their base that taking the U.S. economy hostage has become a standard GOP negotiating tactic. Since swing voters frown on such shenanigans, House Majority Leader Kevin McCarthy (Calif.) has said he would like to end the hostile budget fights and get down to governing. But the Republican leadership always wants that, and in the past they’ve always given in to their rowdy backbenchers. If they can’t get their way through normal legislative means, Republicans might simply try to disable the government by blocking all of President Obama’s nominees until he gives in to a major demand like Keystone approval. They were already doing that by filibustering even moderate, well-qualified nominees until Democrats eliminated the filibuster for executive branch appointees. Now, with a Senate majority, Republicans can block any nominee. To see what else Senate Republicans have in store for the environment, just look at what their House colleagues have tried to do. Earlier this year, House Republicans passed a series of bills to kneecap federal agencies like the EPA. The details are boring and complicated, but the bottom line is that they would institute a number of requirements to burden or constrict the regulatory process. A typical example is their proposal to require agencies to calculate all the indirect costs of every regulation and always choose the least costly option, regardless of its adverse impact on, say, human health. Another example: In September, they passed a bill that would stop the EPA and Army Corps of Engineers from protecting America’s small streams and wetlands. Republicans will also try to prevent environmental regulation by refusing to pay for it. In a typical measure, the House GOP’s EPA budget passed in June would have cut funding for the agency by 9 percent. House Republicans have previously votedto defund the Intergovernmental Panel on Climate Change, which compiles reportson climate science, and the U.N. Framework Convention on Climate Change, the body that hosts international climate negotiations. Now the Senate may join them. Just through controlling the House, Republicans have already forced through milder cuts to the EPA budget and blocked environmental regulations. With control of the Senate, Obama will have to cede even more ground. In fairness to the GOP, elections have consequences and Obama should have to compromise with them. That Republicans lack any actual popular majority — they won because of the rural bias of the Senate and gerrymandering of House districts — is irrelevant. When Republicans claim they have a popular mandate, they are lying, and should be called out for it. But when they say, “We won and we’re going to use our power to enact our agenda,” it’s all in the game. And so you can expect to see a lot of little bits of bad news for the climate and the broader environment in the budget negotiation process. EPA funding will be cut, presumably by somewhere between the roughly stable funding Obama will likely request and the drastic cuts the House GOP will pass. Programs that especially irk Republicans, like those that promote renewable energy and anything pertaining to smart growth, will fare especially poorly. There will also be spending cuts in other departments with environmental implications, like mass transit and transit-oriented affordable-housing development. In terms of Senate election results, the worst of it is over. The map of states with Senate seats up in 2016 is a lot more favorable to Democrats, and they will stand a good chance of regaining the majority. But in terms of environmental policy, the worst is yet to come. “We think he sees this as a critically important part of his second term legacy and there is no reason why he should not continue to go forward on this… both domestically and around the world,” Gene Karpinski, president of the League of Conservation Voters, told a press briefing.